Even with a few programming skills you can with ADbasic acquire measurement data, build up open-loop controls, and realize precise closed-loop controls. 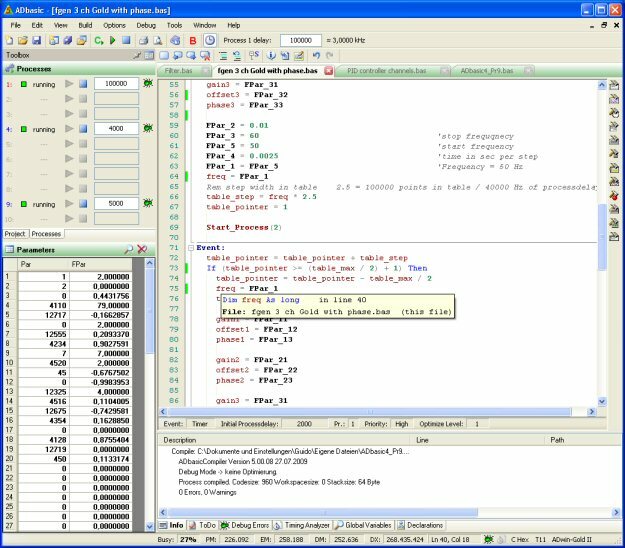 You process raw data and analysis results on your computer with the standard software you are familiar with, for instance with customized user interfaces in C#, Visual Basic, Delphi, Java, Excel, Matlab, LabView, Diadem. ADbasic provides comprehensive functionality, it is easy to use and flexible; this combination makes ADbasic world-wide the tool for fast real-time processes.